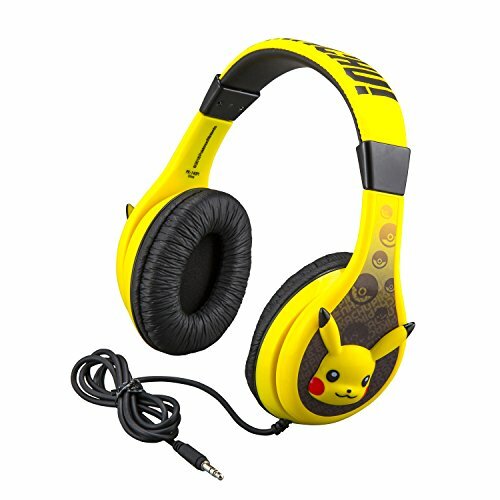 The new Pokemon Pikachu kid friendly headphones are here!! Listen to whatever you like in safety, comfort, and style. These high quality headphones are equipped with a volume limiting switch to ensure safe sound levels for kids. The cool Pokemon Pikachu graphics are perfect for your little one. Plug in your audio device and listen to anything you want. The pivoting ear cushions and adjustable headband provide comfort and quality so you can enjoy your music for as long as you like. This will make the perfect gift or birthday present for your little one! eKids is a supplier of cutting edge electronics with over 60 years' experience manufacturing, marketing, and distributing Consumer Electronics in North America and Europe. Working in collaboration with top licensors such as; Disney, LucasFilm, Marvel, Nickelodeon, DreamWorks, Universal, Warner Bros., Pokémon, and more; eKids brings your kid's favorite characters to life on innovative Youth Electronic products featuring characters from Frozen, Cars, Spider-man, Star Wars, Paw Patrol, Teenage Mutant Ninja Turtles, Shopkins, Minions, Pokémon, and many more. Check out our innovative headphones, ear buds, speakers, microphones, boom boxes, karaoke recording studios, and other products that appeal to fans and collectors of all ages looking for quality electronics products featuring iconic characters they love. Perfect Gift: This will make the perfect gift or birthday present for your little one! If you have any questions about this product by eKids, contact us by completing and submitting the form below. If you are looking for a specif part number, please include it with your message.